The problems of the 21st century are of unprecedented scale. Climate change, financial instability, the housing crisis, the need for health care: all of these are political issues that could be managed with ease on a much smaller scale. But with an enormous global population, that kind of change is no longer an option. As a result, some of the large bodies we once appointed to manage macroscopic problems--such as the government--have begun to fail us. Never was this more clear than during Hurricane Katrina, when individual efforts and decentralized organizations were more efficient, swifter, and better suited to the task than, say, FEMA.But, according to the hard-charging and ambitious Jared Duval, there is good news. Accompanying the expansion of these social problems has been an explosion in information technology, and we are quickly discovering the power of collaboration. Obama's town hall meetings are just the beginning of something larger--a movement towards what he refers to as "open-source" principles. By sharing information and letting systems grow themselves, we can devise new programs that will tackle these sprawling problems. Kiva's innovative micro-lending principles are making impressive progress with huge, intractable problems like world hunger and poverty. The Open-Source Society is more than a persuasive argument, though. It is a manifesto, a narrative both personal and reportorial, and an empowering call to arms. Duval's spirit and intelligence are infectious, and his message is important. 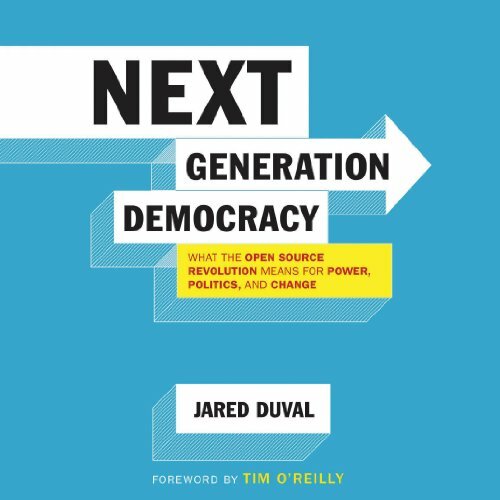 ©2010 Jared Duval, Foreword copyright 2010 by Tim O'Reilly (P)2013 Audible, Inc. I loved the book! I would definitely recommend it.